Thanks to 20th Century Fox, The Star's eCentral have 45 pairs of tickets to a special screening to Life Of Pi. See redemption and screening details below. To get a pair of tickets, visit eCentral page and print it out and pass it to eCentral at their redemption table at GSC 1 Utama. 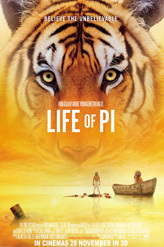 Visit eCentral: Redeem FREE "Life Of Pi" Movie Ticket page for more details. Read more about Life of Pi's movie trailer, pictures & casts info.